A favourite among locals, the Solstice Bar and Grill combines classic comfort food and innovative new specialities accompanied by an extensive wine list. Pop in to this popular Stonehenge restaurant throughout the day to enjoy anything from a quick takeaway Starbucks and pastry, to a delicious dinner with friends or family. Try our popular Solstice Burger, enjoy regional favourites from around the UK in our “Best of British” selection, savour scrumptious classics such as Pan Fried Sea Bass or feast on our mouth-watering Grill selection. Then again, you could just pull up a stool at the bar, order a glass of your favourite beer or wine, and soak up the countryside views through the expansive picture windows. Even if you are just meeting with friends for cocktails; our inviting comfortable lounge makes the perfect place to unwind after a long day. Kids Eat Free when dining with at least one full paying adult. A fresh addition to the Solstice Bar and Grill is our superb Al Fresco dining terrace where we also welcome well behaved dogs (outside only). Enjoy our extensive menu outside and relax with your favoutite drink. 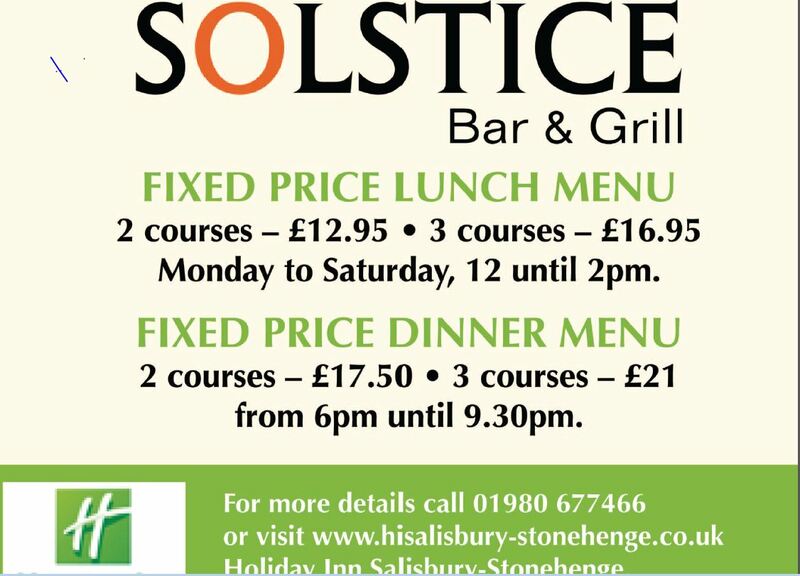 Should the weather turn a little cooler, you can happily remain seated in our popular Stonehenge restaurant as we turn on our external heating units to ensure you remain warm and comfortable. We hold regular themed nights and events within the restaurant, including live entertainment. During these events, there may be a limited restaurant service available; however, every room has access to room service without a tray charge. For tickets and further information on the upcoming events, please see our events calendar.